National Parks are high on my list of places to go for weddings and vacation. I love a good road trip, and to explore. Being in nature under a wide open sky is one of my favorite experiences. After visiting Theodore Roosevelt National Park in North Dakota I saw dozens of spots where I could picture a wedding. I started to wonder how easy it was to plan a National Park wedding. I did some research and found it’s very possible. It’s a lot like planning other types of destination weddings. Tips on planning your National Park wedding. The biggest tip I can give you is: Plan this wedding to bring joy to you and your guests. This will be an adventure into new territory for some guests. National Parks do not have all the little luxuries of a modern wedding venue. The focus of your wedding will be on the natural beauty of the outdoors. National Park weddings work best for couples who want their wedding to be a unique experience for everyone involved, and who don’t mind roughing it a little. Each park is different, but they all require some type of permit. Keep in mind that you want to reserve well in advance. Most permits require a month for processing. Spring is a really good time to have your wedding, because there won’t be as many tourists. If you are planning during the summer tourist season you need to get that permit the minute the park opens reservations for your date. Most wedding information will be found under the Reservations or Permits area on their websites. Call or email the park office to confirm the rules. Northern Minnesota’s Voyageurs National Park has wedding info on their website. Learn about weddings in Voyageurs here. Theodore Roosevelt National Park in North Dakota also has good info. Learn about their wedding policies here. Badlands National Park in South Dakota allows for weddings. Read special use permit info for Badlands. 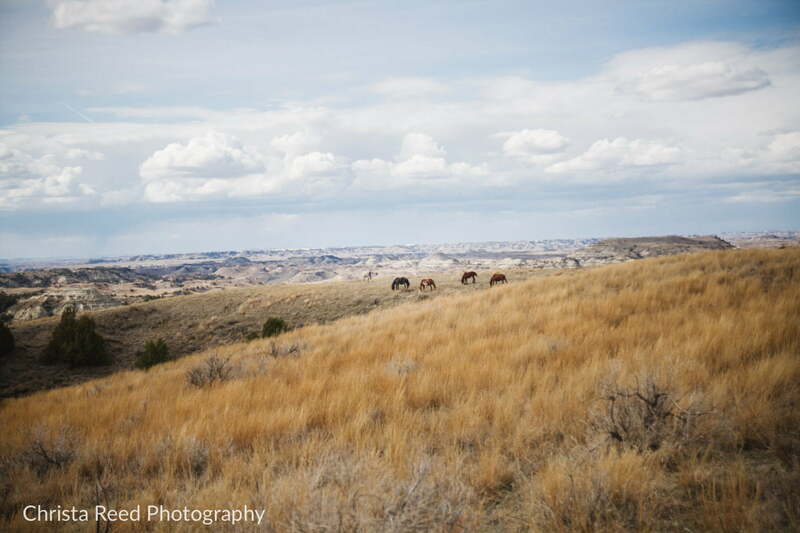 North Dakota’s wild horses and painted canyons make a stunning backdrop for wedding portraits. A national park wedding will be an intimate one. A guest list of 100 or less is a the goal for your wedding and will comply with most park’s guidelines. Send invites out early to make sure guests can plan their travel in advance. Have have a good schedule ready for the invites, because you will need to include specific directions for your guests so they completely understand when to arrive at the park, and where the ceremony and reception will be. Provide all the resources your guests need to plan with their invitation. It’s a MUST to make a wedding website too, so guests have multiple ways to get info. They need printed instructions in case their cell service is not good enough to view emails or websites within the park. Include all options for camping and hotels. Include links and phone numbers to the national park site. You need to to keep guests updated on the weather conditions, make it easy to get their entry/camping permit in advance, and give good hotel options for people who do not want to camp. Find out what the park’s bathroom facilities are like. VERY IMPORTANT both for camping and the ceremony. You want your guests to be prepared, know how much they’ll be roughing it, and know where the closest facilities are to your ceremony site. Make sure your vendors have experience working in outdoor locations that require hiking and have limited electricity access. Also make sure your vendors have liability insurance, and are well informed about any permits they need to apply for to provide their services within the park. Photographers and videographers need to have back up gear, and back ups for their back up gear! Your caterer should be prepared to safely handle food in locations where there are wildlife, including larger animals like bison, deer, and (yes) bears. Even with access to picnic shelters or indoor facilities, your will need to have plans for how to keep food stored so it’s not accessible to animals. A pretty field for portraits, but respect the wildlife, and remember you might need a Back Country Permit to hike off trail. 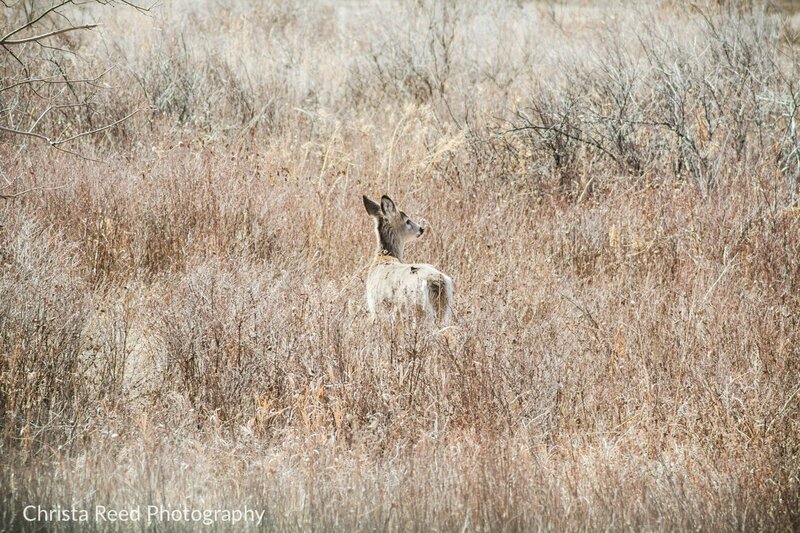 Deer at Theodore Roosevelt National Park in North Dakota. Keep things simple and don’t plan on carting in tons of decor. Be environmentally conscious. Focus on the natural beauty of the park. Get written rules on what you can bring. **Styled shoots in magazines or blogs using constructed arches, tables any other kind of furniture and additional lighting equipment in National Parks need commercial permits. A commercial permit is different than a wedding permit in some cases. To replicate these types of high production shoots for your wedding you need to inform the park of your plans. Get the correct permit for all your props and crew. When venturing into unfamiliar territory, especially in a national park that is out of state, get a wedding planner to help. Look for one that’s experienced planning destination weddings with out of town guests. It will be easier on you and give your guests the best experience possible if you have someone who’s done this before helping you. Have more questions on National Parks? Get in touch me via my contact page HERE. I’m a very big National Park fan. I’d be happy to talk about your photography and help get you additional resources for planning.